If this was a top ten tips you need to know before landscaping, this would be tip number one! Drainage is the most important aspect of any landscape, and proper grading ensures proper drainage. Poor drainage can cause issues with structures in your yard, including your house, garage and sheds. It can also cause soft, wet spots in your lawn areas, and/or your shrubs and trees to drown. Good drainage doesn’t allow water to pool somewhere or run toward the house. A grading plan will show how the grading was designed to drain. The City or County will use this plan to determine if your property elevations are correct along your boundaries and if the internal drainage works properly. Generally a 10% slope is required away from your house for the first 4 feet. You are not allowed to drain water from your property to any of your neighbours, and they cannot drain their water on to your lot. You need to check your property report to see if there is a drainage easement on your land, as the elevation cannot be changed in that easement. Ensure you get a rough grade certificate and a final grade certificate from your municipality. 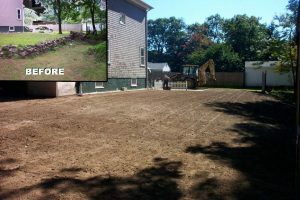 In summary, most people think landscaping is pretty simple, but being aware of what to expect when landscaping allows you to ask the right questions and to realize there are some elements you will want to get professional help or advice with. Remember, proper preparation will help maintain the quality of your landscaping and allow it to get better over time.